Bring the cozy warmth of a folk look to your bedroom with the Folkways Collection! Features a homespun inspired palette of burgundy, mustard, black, and cream, with patchwork "friendship" stars and plaid fabrics. 100% cotton. By VHC Brands (formerly Victorian Heart). 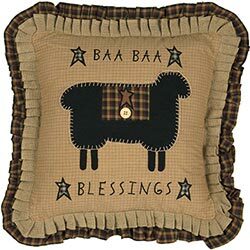 Warm up your primitive bedroom or living room with this folk art sheep pillow, featuring stars and a large plaid patch on a sheep appliqued in the center. Bring the cozy warmth of a folk look to your bedroom with the Folkways Collection! Features a homespun inspired palette of burgundy, mustard, black, and cream, with patchwork "friendship" stars and plaid fabrics. This is for the King Quilt Set. Bring the cozy warmth of a folk look to your bedroom with the Folkways Collection! Features a homespun inspired palette of burgundy, mustard, black, and cream, with patchwork "friendship" stars and plaid fabrics. This is for the Luxury King Quilt Set. Bring the cozy warmth of a folk look to your bedroom with the Folkways Collection! Features a homespun inspired palette of burgundy, mustard, black, and cream, with patchwork "friendship" stars and plaid fabrics. This is for the Queen Quilt Set. Bring the cozy warmth of a folk look to your bedroom with the Folkways Collection! Features a homespun inspired palette of burgundy, mustard, black, and cream, with patchwork "friendship" stars and plaid fabrics. This is for the Twin Quilt Set. 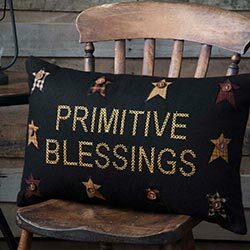 Warm up your folk art bedroom or living room with this primitive blessings pillow. Accessorize your country quilt with the Primitive Check Bed Skirt. This is for the King size. Accessorize your country quilt with the Primitive Check Bed Skirt. This is for the Queen size. 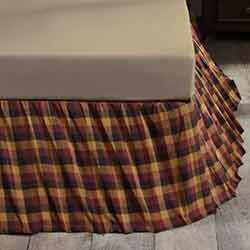 Accessorize your country quilt with the Primitive Check Bed Skirt. This is for the Twin size. 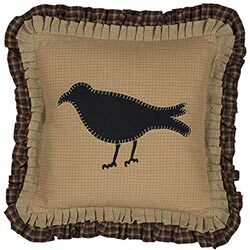 Warm up your primitive bedroom or living room with this folk art crow pillow. 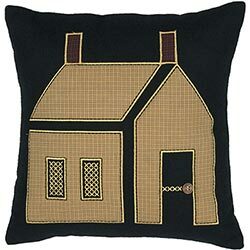 Warm up your primitive bedroom or living room with this folk art saltbox house pillow. 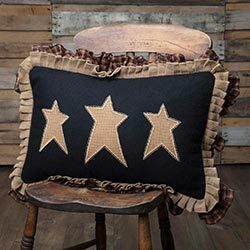 Warm up your primitive bedroom or living room with this folk art stars pillow.